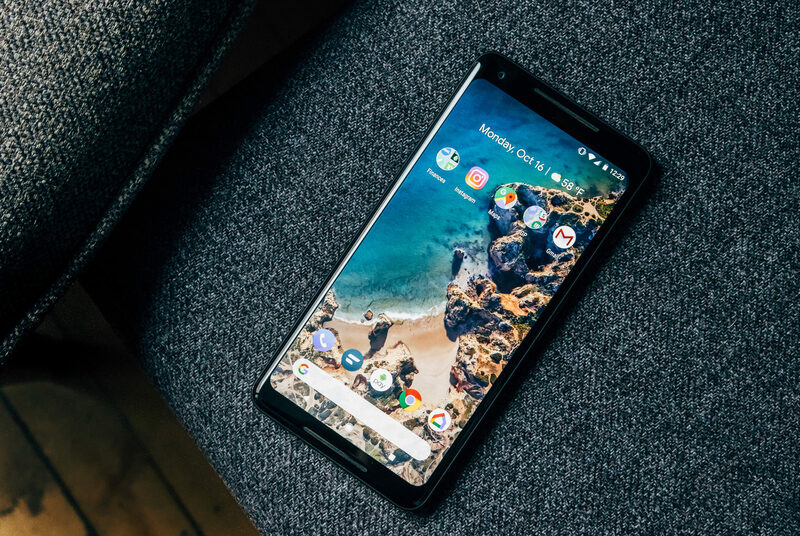 Update the Google Pixel 2 XL to solve screen problems, Earlier today, Google released the November security patch for its Nexus and Pixel devices. 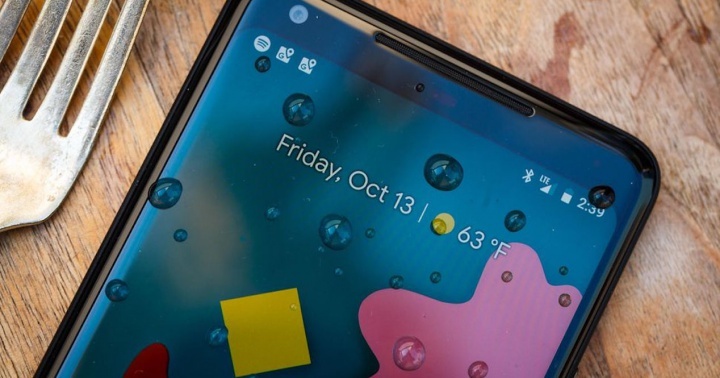 However, in addition to the classic improvements to external attacks, this update to the Google Pixel 2 XL (and Google Pixel 2) contains solutions for the various screen problems that have made an appearance on the smartphone, including more color modes and additional protections. Because Google opts for “more natural and accurate color reproduction,” the Pixel 2 XL screen seems a bit boring to most users. In response, Google promised that users would receive more color modes, including the ability to set a more saturated screen that makes content appear on the Google Pixel 2 XL panel more attractively. Also, Do Read: What is Pixel 2 XL ‘screen burn-in’ Problem, Is there Any fix? The Google Pixel 2 XL is placed as the generational replacement of the Google Pixel XL and the main and most marked difference of this second generation of the Google smartphone is the adoption of the concept of the mobile screen without frames. It is also the first phone to have a score of 98 points in the DxOMark camera tests. The screen of the Google Pixel 2 XL is one of the main and most innovative elements of the new search engine phablet. The brand has equipped the team with a six-inch P-OLED display and 18: 9 widescreen format. This means that Google opts for the new concept of a smartphone with the screen without frames – or case. The panel resolution used rises to 2,880 x 1,440 pixels and density of 538 dots per inch. Additional features include 100% coverage of the DCI-P3 color profile and a contrast ratio of 100,000: 1. In the same way, the display is protected by a layer of Gorilla Glass 5 glass. The processor integrated into the Google Pixel 2 XL is the most powerful registered to date in the smartphone market. We refer to the Qualcomm Snapdragon 835, The Google Pixel 2 and Pixel 2 Xl are both available in 64GB and 128GB Storage variant running on a 4GB ddr4x RAM backed by Android 8.0 Oreo. Google has not opted to include a dual rear camera configuration, as the competition already does, the Internet giant opts to give continuity to a single sensor. The same, with a maximum resolution of 12.2 megapixels – pixel size of 1.4 microns – and an optic with aperture lenses f / 1.8. The main camera of the Google Pixel 2 XL is capable of recording 4K video at 30 fps, as well as slow-motion video of 720p @ 240 as well as 1080p @ 120 fps. With respect to the front camera, the Google Pixel 2 XL includes an eight-megapixel sensor accompanied by optics with f / 2.4 lenses and fixed focus. The video recording is at 1080p @ 30fps. Within the section of the connections of the Google Pixel 2 Xl include the USB-C connection, as well as the disappearance of the mini-jack for headphones. Instead, the manufacturer offers the audio output by the aforementioned USB-C interface, although the sales pack also includes an adapter to continue using headphones with 3.5 mm jack. Among the wireless features, the highlights are the presence of an LTE Advanced cat15 modem capable of connecting to high-speed networks up to 80 Mbps in download and 75 Mbps in upload. Other technical details in this regard are the Bluetooth 5.0 connection and the assisted GPS compatible with the GLONASS and Galileo networks. The capacity of the battery of the Google Pixel 2 XL is 3,520 mAh. 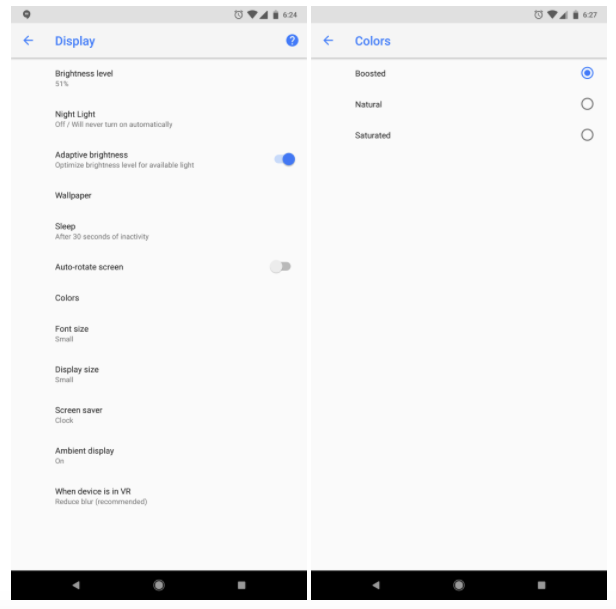 All those who apply this update of the Google Pixel 2 XL can access from the Settings menu to the Display Settings and discover how this November patch adds a new Colors menu that allows users to change to Increased, Natural or Saturated. In this way, the visualization control is in the user’s power. Meanwhile, the attenuated navigation buttons that were first introduced with Android 8.1 Developer Preview have reached the current stable version. After a few seconds of inactivity, the buttons will be automatically attenuated to counteract the screen retention that several users find in the lower part of the panel, which is also known as the “burn-in” effect and which Apple has also advised that it can X appear in the iPhone. Meanwhile, Google also promised that more applications, such as Settings, would adopt a lightweight navigation bar, while the maximum brightness in Google Pixel 2 XL would be reduced by 50 nits to address the problem of “burning” that some users already find in the last flagship of the Internet giant. The last change has already been implemented but Google already warns that “more improvements will be included in our planned software update for December”. The non-screen related issues addressed in this update include a solution for the click sound heard in Pixel 2. The update of the Google Pixel 2 XL via OTA is beginning to reach all users internationally from a few hours ago.